A few years back, bitcoin drew the attention of the world’s best and brightest investors. I had a new exciting gig working for the world’s first regulated bitcoin fund, marketed to institutional investors in Europe and North America. It was headed by three top ex investment-bank traders. With a hard cap on the number of coins at 21 million, it appeared the land grab for bitcoin would only continue to push up its value. The principals of my fund saw bitcoin as the new oil. A volatile instrument, not widely understood, with limited supply and infinite demand. In December 2017, the price of one bitcoin hit a high of NZ$28,080. For those who had bought a year earlier at around $1,000 per coin, this was the time to sell. Shortly after, the bubble burst. Like the Dutch tulip craze of 1636-1637, the price fell stomach-droppingly fast. Today, it sits at around NZ$6,000. 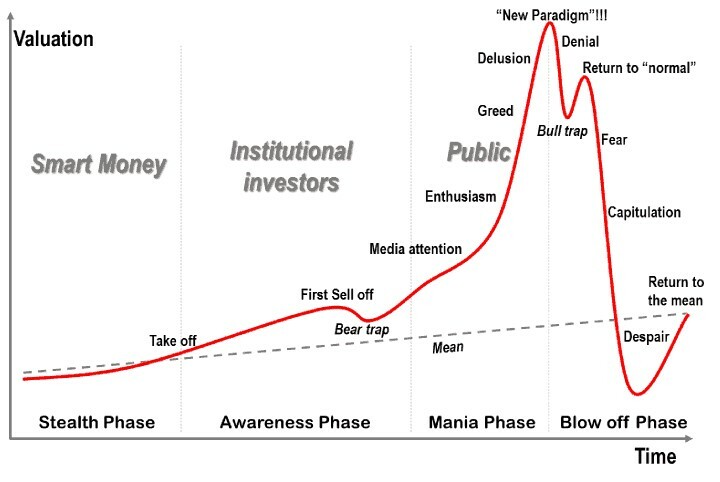 Bitcoin seems to have followed the classic stages of a bubble as documented by Dr Jean-Paul Rodrigue at Hofstra University, New York. When we were marketing the bitcoin fund, the focus was on the imminent utility value of the coins — as opposed to merely existing for speculative investment. And I learnt a powerful lesson: much of an asset’s real value comes down to its utility. In other words — what can it really be used for? Gold has been used as a reliable store of value and medium of exchange since early human history. Since the 6th century BC, the ratio of gold to the price of a loaf of bread has held remarkably steady. With bitcoin, we believed it would go mainstream. When Subway and a bunch of other chain retailers started trialling bitcoin, it looked as though it could be a new way to pay, plus a store of value. An alternative to fiat currency that could hold its value like gold. This was an idealistic dream. A widely accepted decentralised currency free of the machinations of central government. The reality is that using cryptocurrencies to pay for goods and services or even money transfers is a highly niche activity. Of the trillions of cryptocurrency trades, only a tiny fraction is for purchases. And there are problems in the structure of bitcoin itself. At best, it can process at the rate of about seven transactions per second. Credit cards like Visa handle tens of thousands of transactions per second. The cap of 21 million coins does not provide the ever-escalating value envisaged. Because new coins become harder to mine — needing more processing power and electricity — the currency itself is deflationary. Not only do merchants resist accepting bitcoin due to processing difficulties, consumers themselves resist spending it because theoretically its value should increase. Why would you spend something today that could be worth more tomorrow? Eventually, you end up hoarding something with less and less utility value. And the real value of the coins becomes aligned to that. Last year, friends and family were talking of buying a rental property in Auckland’s overheated market. Houses and apartments have good utility value. Everybody needs a roof over their head. And you can rent the property out and achieve yield. He is right. And in a bubble situation, driven by greed, people pay more than the utility. More than what it is worth. The real value of housing comes down to two forces. A multiple of people’s income — what they can afford — and the rental yield that can be achieved as an investment. From the 1950s to the 1980s, people generally paid about two to three times their household income in housing. We’ve lately been paying nine times in Auckland. In terms of the house price-to-rent ratio, up until about the year 2000, house prices followed rents. Then they started to diverge rapidly. 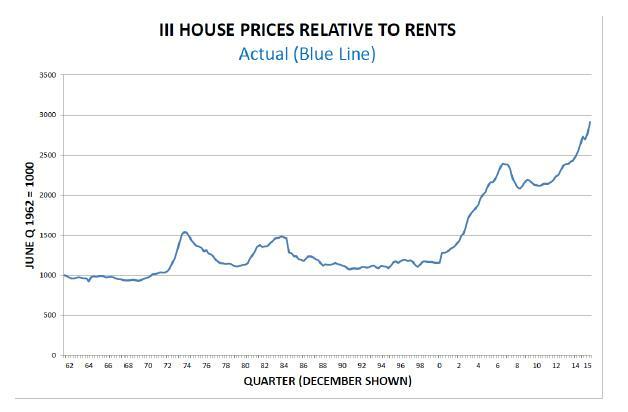 By 2015, house prices had grown more than 2.5x faster than rents. With house prices in Auckland out of step with incomes, rents, and finding less support from external foreign-buyer money, we could be about to enter the ‘blow off’ phase of the cycle, where values fall apart. So where do you find assets with real utility value? I favour shares in companies which have secure dividend streams produced from productive and growing activity. Alternatively, companies that have a disruptive technology that will enable them to capture new income. This way, you’re investing in future income rather than past speculation. Of course, PE (price-to-earning) multiples can also get out of whack in the share market. You must do your homework and find value. One property play in my portfolio has been Charter Hall Education Trust [ASX:CQE]. It’s thriving through the Aussie property bloodbath. That’s because the business is focused on delivering revenue through real utility as opposed to speculating on values. Quite simply, the business owns childcare centres (land and buildings) that are then leased to proven operators. The industry has tailwinds. Demand for early learning is growing. With a strategy focused on being a ‘landlord of choice’ to early-childhood businesses, occupancy is at nearly 100%. Weighted average lease expiry (WALE) sits at 9.5 years and average yield has held at 6.2%. The share price has grown 25% over the past year, while shareholders have enjoyed dividends of around 5% per annum. Of course, there are risks, especially with non-profit Goodstart Early Learning providing 49% of the tenancy income. And there’s the focus on a single sector. Bitcoin, shares, property, or gold? What is this asset worth? What ongoing value and use does it provide? Are the multiples of income to price reasonable? If it’s neither use nor ornament, it’s hard to see the value lasting too long. Simon Angelo owns shares in Charter Hall Education Trust [ASX:CQE] via share broker Vistafolio.